History can be a less-than-exciting school subject for kids. Luckily, entering the past through the world of fiction makes learning history fun for young listeners. 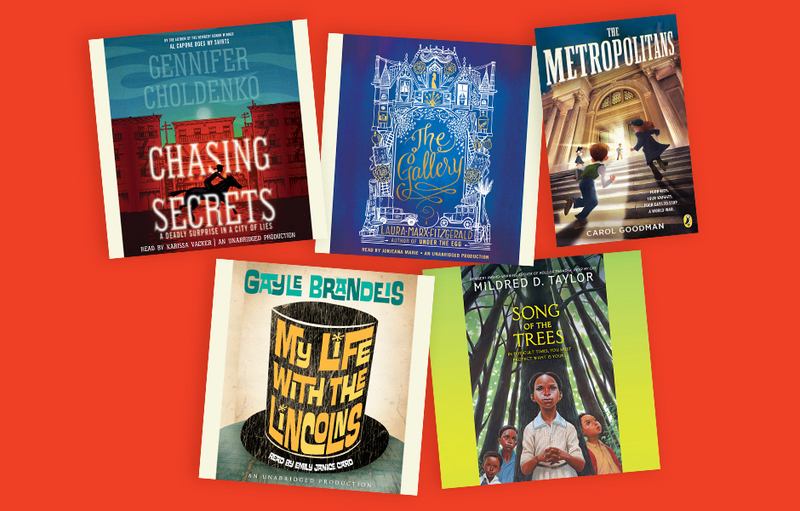 Get your kids hooked on history by listening to one of these audiobooks featuring stories ranging from 1900 to the 1960s. San Francisco, 1900. The Gilded Age. Thirteen-year-old Lizzie Kennedy loves science—unsuitable for girls—but gets to accompany her physician father on patient visits. When they find one person sickened with the plague, everyone denies it—the newspapers, the city, and even her father. So why is the heart of the city under quarantine? Lizzie must break all the rules to put the pieces together and save the ones she loves. It’s 1929, and twelve-year-old Martha has no choice but to work as a maid in the New York City mansion of the wealthy Sewell family. She suspects something is deeply wrong in the household—specifically with Rose Sewell, the formerly vivacious lady of the house who now refuses to leave her room. No one believes Martha, but she thinks the paintings in the Sewells’ gallery contain a hidden message that reveals the truth. Inspired by true events. The day that Japan bombs Pearl Harbor, four thirteen-year-olds converge at the Metropolitan Museum of Art, where an eccentric curator is seeking brave souls to track down the hidden pages of the Kelmsbury Manuscript, an ancient book of Arthurian legends that lies scattered within the museum’s collection, and that holds the key to preventing a second attack on American soil. Mina Edelman believes that she and her family are the Lincolns reincarnated. Her main tasks for the next three months: to protect her father from assassination, her mother from insanity, and herself—Willie Lincoln incarnate—from death at age twelve. Apart from that, the summer of 1966 should be like any other. But Mina’s dad brings the freedom movement to their own small town, with consequences for everyone. With the Depression bearing down on her family, there isn’t much that Cassie Logan can count on anymore. But there is one thing that hasn’t changed—the whispering trees outside her window. They’re also worth a lot of money. With Cassie’s dad gone for work, it seems like no one can stop Mr. Andersen from forcing Big Ma to sell their valuable trees.